Music is important to have in schools. Unfortunately, we live in a time where schools are dealing with intense budget problems, and all too often, it is the music program that loses funding. But a good music program is not expendable. Here are a few of the reasons we need music in the schools. Students who participate in music programs show higher levels of self confidence and better communication skills than their peers. When there is music in the schools, those students involved with group band or chorus activities learn about teamwork and building camaraderie. This is similar to the benefits of participating in team sports. Although adults sometimes don’t recognize this, being a kid can really be stressful. We forget that although the stresses of being a kid aren’t the same stresses we have as adults, they are still significant problems for kids. One of the reasons for this is because kids generally don’t have stress management skills developed and identified. However, playing and listening to relaxing music can help with this. When students have something in school that they enjoy, it helps them stay engaged in the learning experience. They are more likely to stay in school if there is a program that they love. 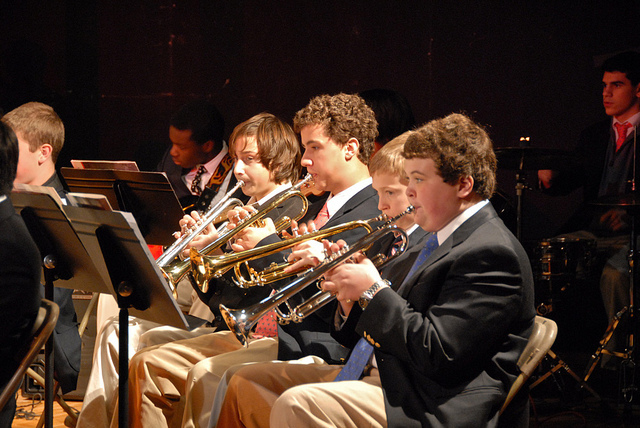 Students who are involved in music in the schools have higher SAT scores. Results confirm that students involved in music score 63 and 44 points higher on verbal and math scores (respectively) on the SAT. Although it’s not popular or fun, memorizing things is an unavoidable part of school. When there is music in the schools, those students involved have improved memorization skills because of the practice they receive while preparing for concerts and performances. Students who play music in the schools also have improved eye-hand coordination skills. This comes from increased motor development due to the physical nature of playing an instrument. Students who study music in school have shown to better emotional development than students who do not participate in music. They are better at coping with anxiety and have shown more empathy toward people from other cultures. Another area where having music in the schools can benefit children is that it improves their auditory skills. People who study music are better at identifying “information bearing elements” in sound. An example of this is understanding the emotional reason for a baby’s cry. Students involved in music are also better at identifying a pattern of sounds within background noise. Students studying music in the schools have also been shown to be better creative thinkers. They recognize that sometimes there is more than one right answer and they can be better at thinking outside the box. Music students also have better attitudes toward curiosity and learning. Any education and exposure to the arts can give your children a more rounded brain and it enhances their imagination. Participating in programs that involve music in the schools can also help children become more successful adults. Music students have been found to be less likely to abuse substances. Music also helps build character and intellectual development. Clearly, there is a strong case to be made for keeping music in schools. It helps the students develop to become healthier, happier and more well rounded adults.